Dýrasta strætisvagnakort sem hægt er að kaupa sér á stræto.is nemur tæplega einni og hálfri milljón króna. Sú upphæð kemur upp ef leitað er eftir korti sem flytur viðkomandi ótakmarkað frá Höfuðborgarsvæðinu til Hafnar í Hornafirði og gildir í níu mánuði. Upplýsingafulltrúi Strætó bs. segir ekki um prentvillu að ræða. 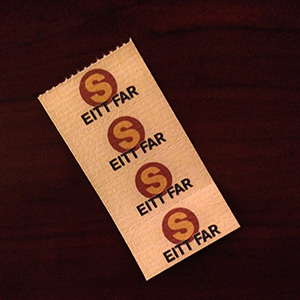 The most expensive bus pass you can buy on straeto.is costs nearly one and half million krona. This total arises if one searches for a pass which gives the bearer unlimited rides from the capital area to Höfn in Hornafjörður, and is good for nine months. A representative from Straeto says this is not a misprint. The verb nema takes the dative when used in this way, which is why you see einni og hálfri in those forms. „Þetta er bara þannig að maður slær inn gjaldsvæði og tölvan reiknar út verð og hættir ekkert að reikna,“ segir Kolbeinn Óttarsson Proppé, en nákvæmt verð kortsins er 1,447,100 krónur. Hann segir engan vegfaranda enn hafa nýtt sér möguleikann á að kaupa strætókort fyrir þetta verð. “This is just someone entering in the payment zone and the computer calculates the price and doesn’t stop calculating,” says Kolbeinn Óttarsson Proppé, as the exact price of the pass is 1,447,100 kronur. He says no rider has yet made use of the possibility of buying a bus pass at this price. One by one the puffins steal my sanity.